H.R. 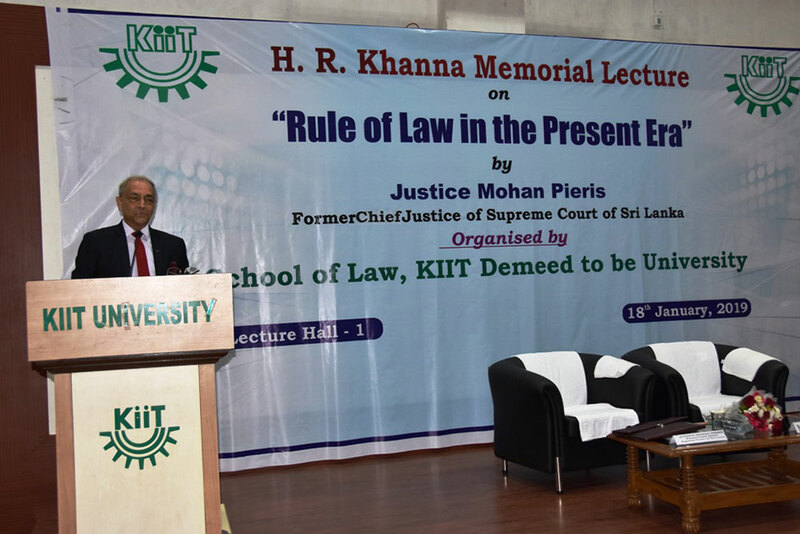 Khanna Memorial Lecture on "Rule of Law in the Present Era"
Hon’ble Mr. Justice Mohan Pieris, Former Chief Justice of Supreme Court of Sri Lanka delivered talk on “Rule of Law in the Present Era” on the eve of H.R. Khanna Memorial Lecture organized by KIIT School of Law(KSOL) at its premises on 18th January, 2019. He elucidated that, though Edward Coke is said to be the originator of concept of Rule of Law, however in India, the concept of Rule of Law can be traced back to the Upanishad. It provides that Law is the King of Kings. It is more powerful and higher than the Kings and there is nothing higher than law. By its powers the weak shall prevail over the strong and justice shall triumph. He further said that in many countries rights such as right to personal liberty, freedom, arrest etc are provided by the written Constitution of a Country. But in England these rights are a result of the judicial decisions those have arisen due to the conflict between the parties. The constitution is not the source but the consequence of the rights of the individuals. “In the Parliamentary Democracy, there are checks and balances. In the context of today’s globalization, desecration is impossible. Life would be impossible without the exercise of desecration. It has to be controlled and should be exercised in the modern world,” commented the Justice. Justice Pieris, drew conclusion to his talk in saying that Rule of Law is a dynamic concept but it is somewhat difficult to define. Every person has its own way of defining rule of law. Some think it to be the supremacy of law. Some think it to be the principles like clarity, universality, stability etc. Due to all these reasons certain ingredients of Rule of Law have been identified and all which need to exist for the concept of Rule of Law to survive. At the outset, Prof(Dr.) N. K. Chakraborty, Director, KSOL welcomed the Justice Mohan Pieris and introduced him to the audience comprising mostly faculties and students of School of Law, KIIT DU. The Talk came to an end with Vote of Thanks proposed by Dr. Prafulla Chandra Mishra, Dean, KSOL.